In mountainous, beautiful Gansu province in northwestern China, life can be hard. Winters are bitterly cold. For much of the year, the land is parched and arid. Keeping bodies and clothes fresh and clean can be difficult. But water is not a big problem in the county town of Qinan. In fact, for four remninbi —about 50 US cents—you can shower and bathe for as long as you please in one of the local for-profit bathhouses. Qinan, a county town of some 610,000 residents, is a marketplace, a service centre and a seat of government for hundreds of surrounding villages. With water scarce in their home areas, it is common for visitors to include a trip to one of Qinan’s 10+ of bathhouses during a stopover. Clean and refreshed they return home: it may be several weeks before they can enjoy the experience again. About ten kilometers away lies Yeo Bao township, a scaled down version on Qinan, serving as a centre for 22 local villages. The 40,000 residents of Ye Bao and its surrounds have difficulty keeping clean. Many villages rely on well water: there are no bathhouses. Individual homes rarely have sufficient water for anything but the most basic ablutions: one basin of water a day for washing is the norm. The irony is that there is water in Ye Bao sourced from the Hu Lu river is piped to Qinan where that four remnimbi buys unlimited flowing water in one of the bathhouses. Village People Project is a not-for-profit organization that invests and builds bathhouses to be run as social enterprises in Gansu and Shaannxi provinces. In May a VPP team was in Gansu to look at a site for a new project. To date, VPP has built bathhouses in four villages allowing thousands of adults and children to benefit from regular showers. Rates of skin disease and other chronic complaints, especially among women, have dropped as personal hygiene has improved. To scale up its work, VPP is adapting its approach and wants to establish its next bathhouse in small township where it could serve a cluster of villages where water is in short supply. Ye Bao seemed an ideal location for such a bathhouse. That was when the VPP team heard from a local official that there was water in Ye Bao and that it was piped to Qinan. Because of the cheap price, there was—and is—no real incentive to curb its use in Qinan’s bathhouses. In contrast, in Beijing, where water supplies are a concern, the incentive to use water properly is clear and effective: commercial bath houses are charge for the water consumed on a per minute basis. This is a classic example of water being mispriced. It’s too cheap for some people and too expensive for others. The result: wastage and misery side by side. 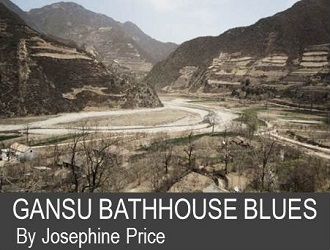 VPP still sees a demand for a bathhouse in Ye Bao run on an affordable basis by a local entrepreneur. It can compete because it will save people going to Qinan to get clean. It can be viable because the VPP approach encourages sensible water usage. VPP bathhouses are designed and built to be environmentally friendly: with water-saving showerheads and re-cycling the used water through filters. It will be tough to run a successful bathhouse in Ye Bao when water is “free” in Qinan. But VPP believes the health and lives of thousands of families, many of them struggling to make a living for their children and elderly relatives, can and will be improved by the project. VPP is a young NGO and our mission is to Improve Personal and Community Wellbeing for Women and Children in rural China by developing well designed, functional and sustainable social and sanitary facilities which serve the communities in need, which have defined and measurable social benefits in partnership with local social entrepreneurs, initially as primary sponsor, owner and developer but later as facilitator and resource platform. We have successfully established four social enterprises in the villages of Maojiazhuang, Xifeng, Sanquan and Sunjiacun, Shaanxi Province working with local social entrepreneurs which are operating profitably, serve a population of 25,000+ and have delivered 36,000+ showers. We are scaling up our operations to reach more villages in need. We are adding a Mini Bath house model to reach smaller villages and a Township Bath House, which will leverage transport links to serve a wider community as well as providing a knowledge and resource bases for that region.VPP is currently working with Shijiezi village in Gansu province on a prototype mini bath house.